Harris Corporation (NYSE:HRS) has shipped their largest mirror ever developed for a ground-based observatory, a mirror that will produce the deepest, widest, views of the universe. Harris is a member of the National Science Foundation team assembling the Large Synoptic Survey Telescope (LSST) on the Cerro Pachón ridge in Chile. The company is providing the 3.5 meter, 3,500 pound secondary mirror and associated ground support equipment. In addition, Harris is delivering the cell assembly that stabilizes the mirror to offset the effects of gravity during operation. Photo is courtesy of Harris Corporation. 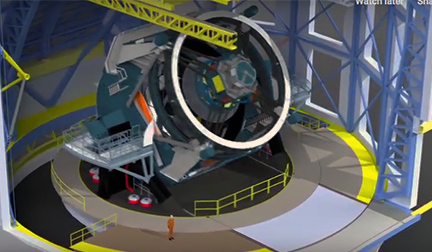 Artistic rendition of the Large Synoptic Survey Telescope. LSST will conduct an unprecedented, decade-long survey of the entire visible sky, detecting billions of new objects and contributing to the study of dark matter and dark energy. Operations are scheduled to begin in 2022. 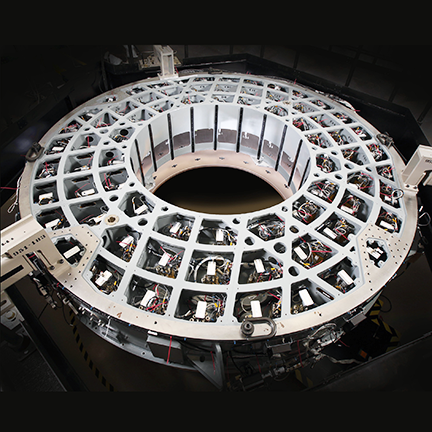 Murali Krishnan, VP and GM, Intelligence, Surveillance and Reconnaissance, Harris Space and Intelligence Systems, said that the Harris-built secondary mirror for LSST continues a 50 year legacy of designing and constructing high-end optical systems that meet challenging requirements. William Gressler, LSST Telescope and Site Manager, added that this achievement marks the successful conclusion of a great joint effort between LSST and Harris. Numerous challenges due to the mirror’s large size and convex shape were overcome with novel and custom fabrication and metrology solutions,. The Harris team successfully completed and is now delivering the world’s largest, active, secondary mirror system and the firm looks forward to the mirror's delivery to the summit site in Chile and future telescope integration.